I have witnessed so many wonderful events in my sixty-two years of life! Some things could only have been dreamed about in someone’s wildest dreams or imagined in the most fertile of imaginations. Televisions, transistor radios, electric typewriters, color televisions, toaster ovens, microwaves, cellular telephones, computers, Walkmans, personal computers, pop-top cans, smart phones, and all the stuff you might be remembering that I have failed to mention! It strikes me as a bit beyond imagining, however, that I am alive to witness a Pope resign from office. Now this is a modern marvel! So what does this do to you? Is your faith shaken? Is there somehow “less church” because the Pope has abdicated? Or does it even matter to you? Like all of the major marvels that have advanced the cause of modernity and the growth of humanity, the resignation of the Pope will have long lasting and deep consequences. It is bold and it is courageous—it is innovative and ennobling—it touches the mind and the heart—it stirs the psyche and the spirit. It is one of the most serious acts one man can do who has faith. What kind of courage does it take to freely lay down power and influence? What kind of confidence must one have in the future when one allows the future he controls to be given over to the hands of others? What kind of faith must one possess in what he has accomplished to allow someone else to take it further? What kind of humility is found in one who can understand that death may not be the only way one faces immortality? As “Emeritus” is added to Pope Benedict XVI’s title, and some of us think we have lived long enough to “have seen it all;” be mindful: we live in the time of the Church. We profess a belief in things that are SUPERnatural—beyond us—above us. Jesus has entrusted His mission of salvation to the Church as the means of sanctification and holiness. The Pope in his resignation is giving us an example of faith, an example of courage, and an example of humility. Once again he is showing us the way to the human face of God—to Jesus Christ! He teaches in this act that God is not finished with the Church any more than He is finished with humanity. I have a feeling we haven’t seen anything yet. . . Stay tuned—stay faithful! Thank you, Your Holiness, from the Faithful of the Diocese of La Crosse! We’ll pray with you and for your successor at Sunday Mass! This entry was posted in Uncategorized on February 28, 2013 by dioceseoflacrosse. We celebrate the Feast of the Chair of Saint Peter, the symbolic presentation of the office of the Pope, on February 22. Pictured above is the Altar of the Chair in the Papal Basilica of Saint Peter. This is the way it is decorated every year for the Feast. “Cathedra” literally means the established seat of the bishop, located in the mother church of a diocese, which for this reason is called “cathedral,” and it is the symbol of the authority of the bishop and, in particular, of his “magisterium,” that is, of the evangelical teaching that he, as a successor of the apostles, is called to guard and transmit to the Christian community. When the bishop takes possession of the local church that is entrusted to him, he, bearing the miter and the shepherd’s crosier, sits on the cathedra. From that seat he will guide, as teacher and shepherd, the journey of the faithful in faith, hope and charity. The “cathedra” or Bishop’s Chair in our diocese is located at the Cathedral of Saint Joseph the Workman in La Crosse. 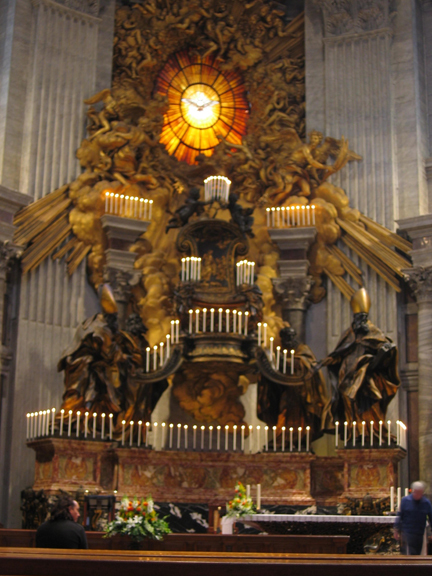 The Altar of the Chair is located in the apse of St. Peter’s Basilica, and is a work of Bernini, made in the shape of a great bronze throne, supported by the statues of four Doctors of the Church, two from the West, St. Augustine and St. Ambrose, and two from the East, St. John Chrysostom and St. Athanasius. On this Feast day, we are particularly called to reflect on the Papacy and pray in a particular way for the ministry that God has entrusted to Pope Benedict XVI. Now, of course, we add a prayer for the guidance of the Holy Spirit as the Cardinals are called to elect his successor in a historic conclave. At the center of the Altar one may gaze on the alabaster glass window that opens precisely above the Chair, thus invoking the Holy Spirit on these last days of Pope Benedict’s courageous and humble ministry and in special prayer for his successor. A special Pontifical Mass, followed by Eucharistic Adoration will be celebrated in our cathedral this Friday February 22 at 12:10 PM on the Feast. All are welcome as we gather in celebration of the Petrine Ministry. But, of course, I’ll see you at Sunday Mass. This entry was posted in Uncategorized on February 21, 2013 by dioceseoflacrosse. While most of us were captivated by the surprising news concerning the resignation of Pope Benedict XVI on Monday, Feb. 11, the Church – who keeps moving along no matter what the headlines may be – marked the Feast of Our Lady of Lourdes and the twenty-first World Day of Prayer for the Sick. Pope Benedict XVI made certain that he was not lost in his personal headlines as he rallied the Church to prayer and awareness of the sick and those who care for them, citing the foundation of the day. This week has been filled with many calls for prayer across the diocese and in my own circle of friends. We have been called to pray for a hospitalized 17-year-old who suffers from the effects of a debilitating aneurism and the surgery necessary to save her life. Her parents and family ask for prayer. I heard from a dear friend who slipped on the ice on his way to work a couple of weeks ago. He went down with a thud and cracked his head on the sidewalk. The force of the fall also injured the front of his brain; he fell unconscious, and awoke in the hospital on his way to his first CT scan. My sister Joann suffers, as all the members of my family do, with the “family knees” and its associated pain and discomfort. On and on, the phone rings, family, friends, and members of the faithful from around the diocese and beyond, call to be remembered at Mass and before the Blessed Sacrament. The sick and the needy are everywhere. There are those, who like my own mother, before she died, don’t know how sick they are; they have forgotten the basic skills of how to eat, how to find their way home, the names and faces of their own family members. Then there are the doctors, nurses, therapists and technicians. There are countless numbers of caregivers and volunteers who offer their time and talent to the numbers of sick, elderly, and needy. We remember them in fond and compassionate prayer. We remember, of course, the Good Samaritan – the personification of Jesus, who offers himself, his wealth, his very life, to protect and care for those who fall prey to the sad circumstances of life, the trials of aging, and the harsh realities of disease and death. In our time, Blessed Teresa of Calcutta still holds the example of the modern day Samaritan – the image of Jesus. In those who follow her example, mirroring Christ’s tenderness, we see the perfect example of what we seek in this Year of Faith – we seek the face of Christ. It is no accident that the World Day of Payer for the Sick is celebrated on the Feast of Our Lady of Lourdes. Who can forget the attraction to the Mother of God each of us experienced when we first heard the story of the Virgin – the Immaculate Conception – who appeared to the young Bernadette in 1858 at the grotto in Southern France? Who does not still tremble and offer a silent prayer when Lourdes water is brought to the sick and infirm? Who doesn’t pray for miracles – for healing – for comfort? Our Blessed Mother is with us as we seek the face of her Son in our sick brothers and sisters – when we welcome Him in her name and pray for the sick with faith in Christ’s power to heal and Mary’s power to comfort. The World Day of Prayer for the Sick may have been vying for newsprint this year with an historic headline – but the sick still need your prayer. And no, Pope Benedict did not abandon the sick in the pursuit of sympathy for his health or rationalizations for his resignation. As the Vicar of Christ, he urged the Church to go forth and follow Christ in service to the least of our brothers and sisters. In our diocese, we are blessed to offer our service and raise our voices through the intercession of our beloved friend and servant of the sick and poor, Father Joseph Walijewski, whose Cause for Beatification we raise and whose assistance we seek as we try to do our best each day to meet Christ face-to-face. See Christ at Sunday Mass – He’ll be looking for you! This entry was posted in Uncategorized on February 15, 2013 by dioceseoflacrosse. CATHOLIC MORALITY – AND WHAT A WORLD! My head is swimming with all the information we bishops have received regarding insurance – both how it affects us in the Church, and how the new healthcare legislation affects all of us Americans who now must (try to) live with it. It is all very confusing, complicated, and filled with contradictions. We, of course, remember that the major flaw remains the universal call for “reproductive rights” (code: abortion) built in from the beginning. Some information came regarding the HHS mandate. Last week the Administration offered another accommodation – 70 pages worth of documentation – for religious institutions to consider. Very little discussion came from the presentations simply because the bishops and our advisors have to really study the options being offered. It is difficult to believe, however, that anyone deeply associated with the mandate is genuinely eager to assist in the cause of life and the genuine care for women and unborn children. Some issues regarding Catholic healthcare and the management and administration of Catholic institutions and hospitals were presented along with the legal (both canonical and civil) components of these areas of the Church’s mission in the footsteps of Jesus Christ. Several keynote speeches were absolutely dynamic and stirring. Archbishop Vigano (the Apostolic nuncio) delivered the greetings of the Holy Father and in his name, called us to the challenge of love that is lived only in the light of faith; a great message for the Year of Faith and the cause of moral truth and liberty. Archbishop Gerhard Mueller, the Prefect of the Sacred Congregation for the Doctrine of the Faith, raised the bar even further with awareness of the cause of Vatican II so boldly presented in the Church’s own reflection on Herself in the pure light of Lumen Gentium and the clear teaching of the Catechism of the Church. Cardinal Rodriguez of Honduras offered tremendous teaching on the call to holiness and the authentic challenge of living the truth – and serving the truth – in love. These latter points channeled the Pope’s influence concerning the Year of Faith and dramatic call of Christ in this world at this time! The conference was attended by bishops from Central America as well as bishops from the U.S. Simultaneous translations were available; some presentations were offered only in English or Spanish depending on the specifics that were being taught. Our diocese was singled out especially because of our work for awareness and education in the rejection of POLST in the dioceses of Wisconsin. More discussion was conducted also in the areas of hospital mergers and the specifics concerning Catholic hospitals in the future. Please continue to learn from Christ at Sunday Mass – see you there! This entry was posted in Uncategorized on February 8, 2013 by dioceseoflacrosse. I’ve just returned from one of the best days of my life. Yesterday (Thursday), I celebrated the Mass and had lunch with some of the finest young people in our diocese at Newman Catholic Schools in Wausau. Truth be told, my day at Newman was to be the finale of a weeklong diocesan funfest celebrating the annual national Catholic Schools’ Week. Due to sickness and weather I only had the chance to celebrate two major events marking this special time of the year. First of all, to start Catholic Schools’ Week, I celebrated the Mass for the annual Brains and Brawn activities last Saturday. The events, academic and athletic, were conducted at the facilities of Aquinas Catholic Schools in La Crosse. The Mass was celebrated in a near full Cathedral of Saint Joseph the Workman. So many of our parents, teachers, and students were there. We celebrated brains and brawn, with Spirit and Life! And it became clear at the start of this Catholic Schools’ Week we were working to raise the standard (this year’s national theme) and seriously consider Catholic education as the standard of excellence in our lives. Next, I was due at the Newman Center and Saint Joseph Parish in Menomonie on Sunday evening. I had to cancel due to a bad head cold courtesy of temperature changes from Bolivia to La Crosse. We will reschedule the evening at Stout. I look forward to spending time with some of the “big kids,” too. Saint Mary’s Assumption, Durand; Saint Francis of Assisi, Ellsworth; and Saint Joseph, Menomonie, Catholic schools were on the docket for Monday. Alas, my cold and an ice storm prevented that celebration. We’re planning a rematch at this writing. Saint Mary’s in Tomah was to round out the week, but Wednesday’s blizzard put the kibosh on that one. Even though the roads were snow-covered, we made it to Wausau and I don’t think anyone was disappointed. I am so proud of our Catholic schools. All seven systems are functioning at full throttle and doing well. All of our parish schools seem to be holding their own as well and fulfilling the mission of teaching as Jesus did! Our schools cost a tremendous amount of money; and our parishes, assisted by the generous support of the Diocesan Annual Appeal (that’s you, too, folks) continue to scrape together the funds needed for operations and future growth. This is a wise investment – the investment in the Catholic education of our children. This investment is a value to our community at large; and, of course, an inestimable value to the future of our beloved Church. I thank you from the bottom of my heart for your support, at whatever level, for our wonderful and essential Catholic Schools. Through them we raise the standard of living for all people! Yes, I’ll see you at Sunday Mass. This entry was posted in Uncategorized on February 1, 2013 by dioceseoflacrosse.